Rick Torres, President and CEO of the National Student Clearinghouse, recently wrote an article for Forbes regarding Clearinghouse data to help adults who have “some college, no degree” earn a credential via reverse transfer. Within that group, there are 21 million learners who completed multiple terms at postsecondary institutions. In fact, more than four million of these learners stopped out with more than two full years of academic learning completed within the last 10 years, but have no associate degree or credential to show for it. 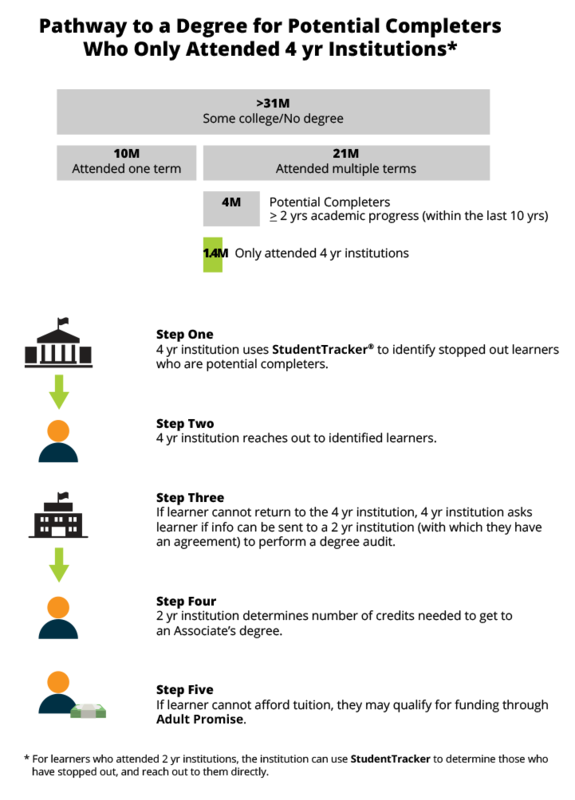 The National Student Clearinghouse has built a Reverse Transfer and Course Exchange platform to support state Adult Promise initiatives for the adults across the country who have “some college, no degree.” Reverse Transfer provides the opportunity to improve degree attainment and earnings for adults by making a dent in the “some college, no degree” learner pool. Read the article, to learn more how the Clearinghouse is helping institutions serve adult students.